KINGSVILLE TOWNSHIP – The snipping of a red ribbon officially marked PCS, or Person-Centered Services, as the new service provider of Ash/Craft Industries and Greenhouse. Hosted by Greater Ashtabula Chamber of Commerce Director Greg Church, and part of a four-hour open house of facilities serving Ashtabula County’s developmentally disabled adults, the ceremony took place inside the reception area of Ash/Craft Industries at 2505 Green Road at 12:30 p.m. March 14. “I appreciate your being here. This is a time of exciting change,” Church said. have been taking place behind the scenes starting Jan. 1, when PCS, of Millersport, officially took over. Though relatively unknown in Northeast Ohio, PCS began in 2007 offering day services to developmentally challenged adults in Defiance County. Its founder was frustrated at the lack of services available once his 22-year-old son graduated from that county’s Happy Hearts School counterpart. The timing was good. By 2012, the “handwriting was on the wall” when it came to Ohio Developmental Disabilities boards continuing to run such programs, as the push from the state was away from county-run workshops. Two years later, the state mandated that programs be privatized within three years, by 2019, but recently re-set the deadline to 2022. PCS was one of several companies that put together a proposal to operate Ash/Craft Industries and Greenhouse. PCS’ mission is to provide and coordinate person-centered opportunities for meaningful integrated vocational, recreational, leisure, social, volunteer and educational activities for individuals with disabilities to enhance individual career opportunities. Rather than cut the red ribbon on Jan. 1, PCS wanted two months to make sure the Ash/Craft program was running smoothly. “Keeping the same staff was key,” Oliver said. PCS is offering services to 200 developmentally disabled adults in Ashtabula County from ages 21 to 70. Some are employed in the workshop, and others in the community. Once on the roster, adults may stay for life. Ashcraft remains a non-profit entity and PCS staffs and pays the employees. AshCraft funding comes from Developmental Disabilities board levies (40 percent) and federal funds (60 percent). The DD board pays for Medicaid “waivers” which authorize funds sent to providers. “Levies are important,” Oliver said. Volunteers are also critical to the program’s success, Oliver said, especially in employing adults in the community. “Our mission is to make sure these individuals are part of the community, to give back,” she said. “It all worked out. People are going to the same places with the same transportation,” said Oliver. Several dozen people who took advantage of the opportunity to tour the workshop stepped inside a clean factory humming with activity as busy adults worked to fill a 2,000,000-piece order for Macy’s involving placing cotton in small square white boxes with the red Macy star logo on top. Tour guide Jim Hornbeck, of Ashtabula, said Ash/Craft also has contracts with Ashtabula County Medical Centre and Fastenal. “They like our work,” said Hornbeck. PCS also has a philanthropy arm, “Empowering Life Without Limits,” or ELWL. One ELWL project is to open a “Snack Shack” at Ash/ Craft, with proceeds going to a lake house retreat on Lake Erie where the adults can relax for a week to get away from it all. ELWL also offers an “Exploration Award” grant for individuals with disabilities to “discover, explore, and chase their dreams,” and subsidizes “big trips” that offer individuals the chance to participate in excursions. Of many behind-the-scenes changes, one of the most popular components of Ash/Craft – the Greenhouse – is unchanged. It will open April 1. All in all, the PCS transition has been overwhelmingly positive. 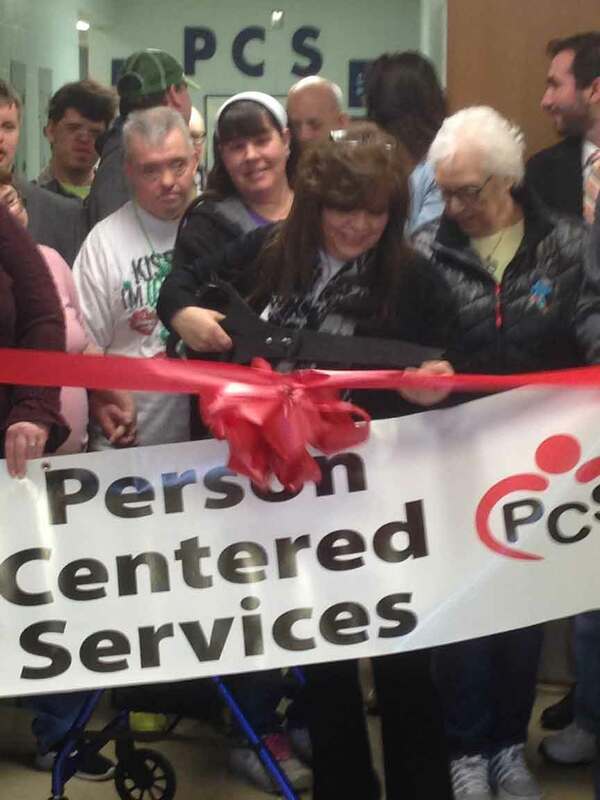 AshCraft Director Jill Oliver cuts the red ribbon March 14 to formally recognize Ashcraft’s new owners PCS (PersonCentered Services) of Millersburg. The facility has been renamed Ashtabula Career and Life Enrichment Center.